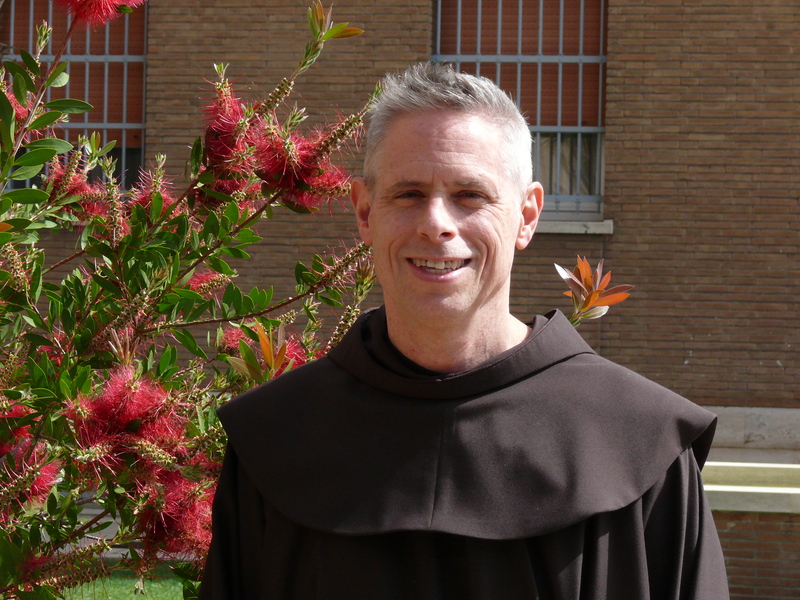 Michael Perry, OFM, is the Minister General of the Order of Friars Minor. In an unprecedented fashion, Minister General Michael Perry, OFM, attended the first day of our provincial chapter and addressed Holy Name Province friars about the state of the Order and its future. He told us the latest numbers appeared bleak to some, but that they were misleading. As of December 2012, the order was “down” to 14,077 friars worldwide with 1,400 men like myself in initial formation (with my province accounting for 17 of those men, the most of any of the United States provinces. In fact, the 2000s produced more vocations than the 1990s, showing a small, but important upswing in vocations!) We have friars in 113 countries and have 125 semi-autonomous entities of leadership, i.e. provinces. In this way, our Minister General’s message was not of death but of new life. How, as friars minor or the Church in the United States, are we to live in order to promote the growth of Gospel living and Christian fellowship in our world? The five points he gave are tremendous reminders to us as friars but are also values that would no doubt help any part of the Church grow. Who are we, and where do we want to go. Any good business requires a mission statement. Why not the Church? Sometimes with a two-thousand year history, 1500 page sacred text, and countless popes, bishops, and priests each giving helpful guidance, it can be difficult to clearly state who we are and what we are about. As Christians and friars, we need to make it clear what we believe, why we believe it, and how we are going to live that message. Even for those who have been Christian all their lives, it is helpful to remind ourselves of what called us to this life in the first place: the eternal and all loving God, wanting to be one with all that God created, became human, experienced all that we experience, died and rose again forgiving all of our sins. It is a message of love, forgiveness, peace, mercy, and justice; it is one of eternity. I can only assume that Michael Perry, ofm, is an avid reader of my blog because the next two points are exactly what I wrote in The Medium is the Message (clearly, he could not have gotten the idea anywhere else…) He spoke to us of the power of symbol, that the message of how we live, how we treat others, and how we stick to our own ideals, speaks much louder than the words we actually say. It is a call to authenticity and integrity, like our chapter theme, to be who we say we are. It is quite easy to criticize the world we see around us, but are we living up to the same standards we place on the rest of the world? I am not saying, and I do not believe he was, that we may only speak truth to power if we ourselves are perfect; this can never be the case. What I believe he was saying, though, is that our words and actions must be one if we are to ever be heard. More specifically, this means a simplicity of life, materially and spiritually. How easy it can be to become cluttered and distracted, focused on the things that do not matter. When we possess something tightly without our hands they cannot be open to receive the graces that are always being given us. As friars, we are called to be itinerants and poor men; as Christians, we are called to remove everything that impedes are relationship with God. With Jesus, our Pope, our patron Saint Francis, and many others in the Church, Michael called us to simplify our lives of the clutter, whatever that may be. “The devil you know is better than the devil you don’t.” Because the “unknown” poses such a risk to our comfort, change can be traumatic to some. More times than not, we seek to maintain the status quo, even when it’s clear that it is not fulfilling. The easiest path is the one of least resistance, but it is not the one of movement. We are called, especially in this time, to be risk-takers. We are called to step out of our comfort zone, to allow ourselves to be moved, and to move the world. Do we want to sit idling by as the world continues to change all around us, tightly holding to what once was rather than accepting what is now, or do we want to step out there and be the change we wish to see in the world? The Church needs creative thinkers that are willing to risk everything for the life of the Gospel message. Lastly, this is a journey that we must do together. Like it or not, we are all brothers and sisters on the same road, and we need to find a way to not only “get along,” but to grow in love and respect for each other. Having now lived with more than fifty different men in the past three years, I understand completely that it is impossible to like everyone. I simply cannot like everyone. But that doesn’t mean that they are unlikeable, and it certainly doesn’t mean that they don’t deserve my love and respect. Michael pointed out that dialog, transparency (of self and finances), communication, prayer, and fraternal love are all essential to walking this road together. We must always remember that Jesus is the center of our lives. If we do this, Christian hope will always be alive, and we will be able to live with hospitality, nonviolence, liberty of spirit, boldness, tolerance, and care for the poor and marginalized within our homes. Peace and good be with each of you. I hope that this paraphrase and interpretation of our Minister General’s message finds you well and that you may join us friars in trying to live it out.